See the Frostrosen blob this morning? Guess what? I have two more rows before I start knitting the edging across the top of it! Yipppee! I started this poor shawl in April, but it got shoved in a bag and ignored while I knit the Mystery Stole and while I started the red blurry thing. It's been very patient with me and didn't drop any of its stitches while it was waiting for me to come back to it. It's not a hard knit, or even boring, despite the repetition of the design. It has a nice rhythm to the pattern and is great for TV knitting. For those of you who haven't seen this on my blog before (did I mention it's been shoved in a bag? 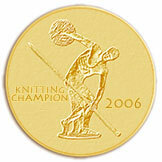 ), here are the details: Knit in handspun yarn from Frostrosen Kitchen Sink Batts. The pattern is The Green Moss Shawl from Heirloom Knitting and I'm working the smaller size (which is still looking like it will be quite large.) I might actually get this finished and blocked soon so I can wear it this summer! I finished up my pal's socks over the weekend! Now all I have to do is gather a few gifties for her and get ready to mail them out next week. To recap all the details: The yarn is Merino/Tencel from The Woolen Rabbit in the Peacock colorway. 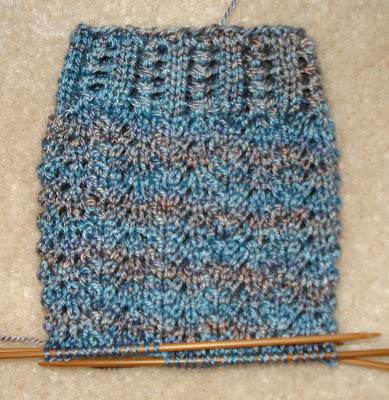 The cuff stitch pattern is one I tossed together, but probably isn't a new stitch pattern. I gave directions for it sometime last week or so. 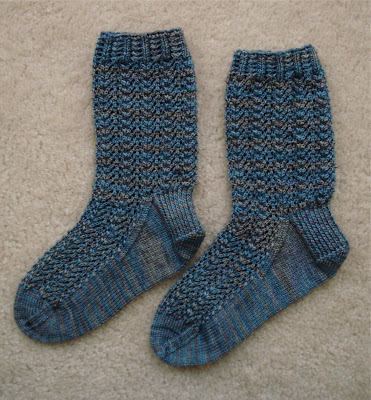 The sock's stitch pattern is from the Vog On socks from Knitty. I love the way the yarn feels and I hope that my sock pal does too. The Vog On Stitch pattern is a nice one also - seven stitches wide and four rounds for the repeats, so it's easy to memorize. I will definitely be making myself a pair of socks with this stitch pattern. Why Yes, We Do Still Spin Around Here! And here's proof! 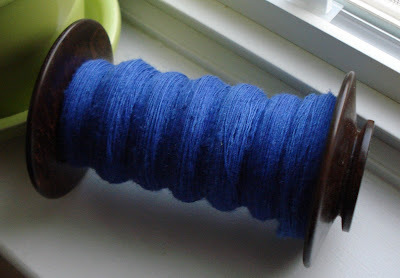 This is the first bobbin of singles from the Romney/Merino blend I did on my drumcarder. There is a bit of Angelina in the blend, but it didn't photograph well. I feel like it took me just about forever to get this spun but that might have been because I haven't really been working on it. It's funny how that works. Yesterday we went shopping for Caleb for back to school clothes. I'm one of those moms who tends to buy shirts a bit too big so that Caleb will have some growing room in them. He goes through a size of jeans about every 6 months though (although that seems to be stretching out to a size every 8 months or so now - whew!). Because of this, last year we only had to get him a few shirts and a bunch of new jeans. This year, we are practically starting from scratch though. I was pleasantly surprised that except for his rain coat, he doesn't need any new coats. We did pretty good though yesterday. He's got his shirts, some cargo pants, a backpack and lunchbox, so now we just have to get some jeans and a couple pairs of shoes. He was even a good sport and tried on the clothes at the store. 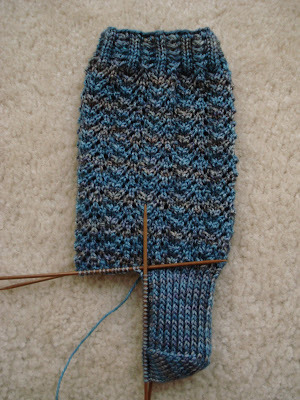 I'm knitting merrily along on sock number two for my Sockapalooza Pal! I'm really pleased with these socks and I love the way the yarn looks and feels. It's a bit heavier than a pure wool would be, with the Tencel content, but the Tencel also adds a shine and drape that pure wool wouldn't have. I gave all the details on the sock and the pattern in a post last week, but I forgot to mention one thing when I was writing directions for the ribbing pattern I used. When you do the YO just after the purl stitch, wrap it the opposite direction that you usually make a YO. 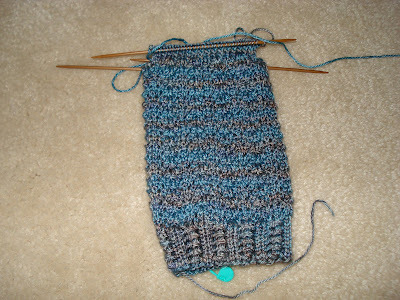 Then on the following row, you'll knit this stitch through the back to untwist it. It sounds fiddly, but it's not hard to remember or to do and if you don't, those YO's will be much smaller than the other ones. I'll go in and make a note by the ribbing directions too. Do we still spin around here? It would seem so from the stash enhancement that arrived Friday. I got this from Delia at The Fiber Denn (she has an Ebay shop and an Etsy shop- yep, two Internet branches to serve you!) 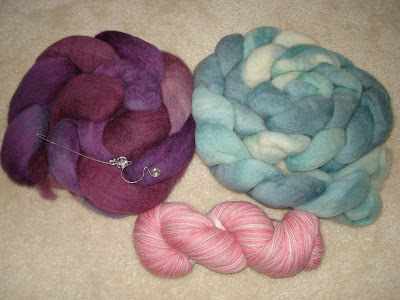 At the top right is about 7.5 ounces of BFL (Blue Faced Leicester for non spinners) in her Love in a Mist colorway. Below that is Candy Stripes in her Zebrato Sock yarn - pink stripey goodness! I also got her Gretchen pattern which is a beautiful round shawl. But then, when I got the package, there were a couple of other things that had hopped into the box courtesy of Delia - on the top left is 4+ ounces of BFL in Malva Mystic (can we say YUM?) and laying on top of it is an orifice hook. It has a clear glass bead with pink flowers in it and it has two tiny little bells attached just below the bead. Now every time a yarn breaks an angel gets it's wings! I cannot tell you how beautiful these rovings are. Not only are the colors spectacular and the different tones within each roving combine in interesting ways, but the rovings aren't compacted or fuzzed up or showing any of the other usual signs of having been hand dyed. Go take a look at her shops (they have different things in them) - you won't be disappointed. 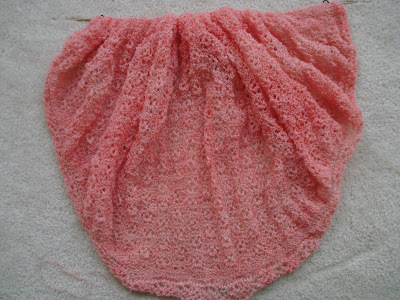 I also wanted to mention that if you haven't found it yet, there is a Hanami Knitalong being formed. Just click the link to get more information. I'm not a part of it officially, but I plan to pop in periodically and see how everyone is doing. 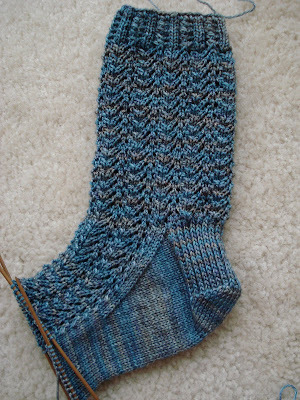 Last night I finished my first Sockapalooza Pal's sock (sock specifics in yesterday's entry). 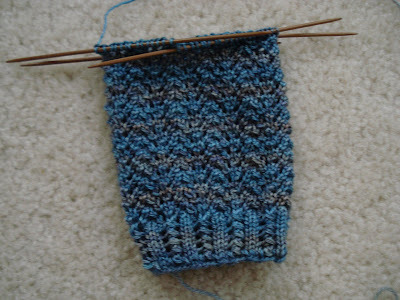 Now that I know how many rounds to work, the second sock should go faster (theoretically, anyway). I always forget that it's harder to knit socks for people who don't live in this house. It's hard enough to get the one's who do to sit still and check how a sock is fitting, but when you're knitting for someone you've never met, whose feet you've never seen, it's even harder. 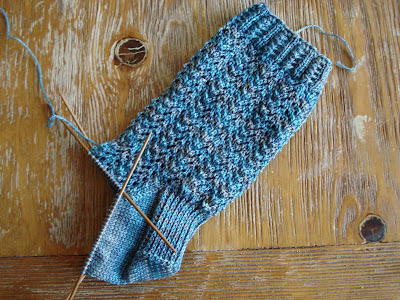 Since I always keep track of the number of rounds on the first sock (number of ribbing rounds, number of rounds to the heel flap, number of rows in the heel flap, number of rounds in the foot before the toe decrease), the second sock seems to go faster because I know how much farther I have to go in any given section. I did some blog housekeeping yesterday and added yardage and specific yarn information to the stole patterns that didn't have it. I also changed the purchasing a bit. I added shopping carts so now you don't have to buy each pattern in an individual transaction - you can buy as many as you like in one transaction! The other thing I did was add a link to last Friday's blog entry in the sidebar. I also put the phone number for the National Domestic Violence Hotline there - so that if you or someone you know ever needs it, there it is. Thanks for such a great response to Genesis last week. This is such a great, well thought out program and I appreciate that many of you have contributed with me to make sure that they can continue their programs and outreach! I'm more than halfway down the foot on my Sockapalooza Pal's sock. I'm past the gusset and I have about 2-3/8 inches left to go before I start the toe decreases, that is if I'm remembering her shoe size. I've got to double check that before I get much more done on these. It would be nice if they actually fit my pal! Tuesday there were a lot of questions about the sock pattern. I'm using the stitch pattern from the Vog On socks from Knitty, came up with my own rib pattern for the cuff (I've included it below, it's pretty basic and I wouldn't be surprised to find variations of it in every stitch dictionary out there), and slapped the whole thing into my basic sock pattern recipe. I thought about designing a special sock pattern just for my pal, but with MS3 taking over 90% of my brain, the other 10% just couldn't come up with a sock pattern. Oh, and in case you were wondering, the yarn is Merino/Tencel from The Woolen Rabbit in her Peacock colorway. The Eyelet Rib Stitch Pattern: Repeat of 7 stitches wide. Round 1: *K1, P1, K3, P1, K1, rep from * to end of rnd. Please note that on Round 2, the YO just after the Purl stitch should be wrapped the opposite way to a usual YO. Then, on the following row, knit that stitch through the back loop to UNTWIST it. If you don't the first YO will be much smaller than the second YO. MS3 UPDATE: For those of you who were part of the group and got bumped off due to a Yahoo glitch when you tried to change your email address, please leave me a comment with the email address that you were originally signed up with. Once I verify that you were a member at one time, I will email you on the old email address to get the email address you want to use now and send you an invite on the new email address. I apologize for making you jump through hoops like this, but I have had to turn away people who missed the sign up deadline, and this is the only way I know to keep things fair. Again, leave me a comment with your email address in it and I can get back to you. Well, I decided to be nice and show you the red thing I've been working on. Oh, did you expect it to be in focus? Yeah, that's not going to happen yet. Sorry. At this point I'm more than 1/3 of the way through with it. 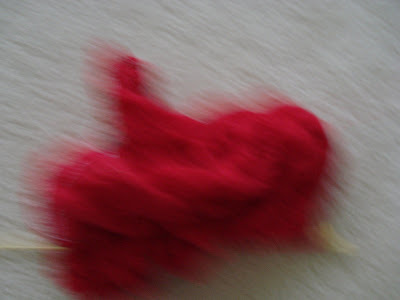 I'm going to slow down on knitting the red thing for a bit, since I can't show you what it looks like until the last clue goes out for the Mystery Stole. 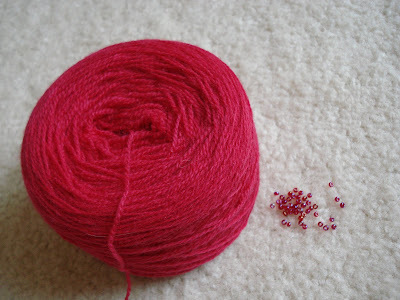 In case you were wondering, this red thing is the "Extra" that will be part of the official Mystery Stole 3 Pattern. I like to put in extra designs or variations with my patterns and the "Extra" for this pattern, while it has nothing to do with the theme of the Mystery Stole, does take some of it's patterning from the stole, so I can't show you what it looks like yet. Thanks for all the wonderful comments about Genesis on Friday's post! You guys are the best! For those of you who have been asking questions in the comments: Blogger doesn't give me email addresses with comments, so I can't reply to you. I'm not being rude on purpose. I'd be happy to answer your questions, you just have to leave your email address for me. Oh, and if you were wondering what yarn and yardage I used for each of my patterns, I'm planning on going into each pattern post this week and listing that information. I have no idea why I didn't put it in there in the first place. Last weekend the Mystery Stole 3 group decided it wanted to contribute to a charity. This has not been nor will it become a required part of participating in the Knit Along, but I understand the desire to give back when something is given to you. I thought I'd devote a blog post to my favorite charity because whether anyone feels moved to contribute or not, everyone needs to know about it. Many of you who have been reading my blog have heard me talk about my Sister In Law, Mindy. For those of you who are new to Pink Lemon Twist, Mindy is the owner of the original Hanami Stole. The one in the picture on the pattern. That's her's. Mindy works for Genesis Women's Shelter in Dallas, Texas. Her current job is primarily fundraising for the Shelter and it's programs. Prior to this, she spent several years "in the trenches" with this organization. She answered the 24 hour hotline they operate, she was a case worker, helping women find the strength to pick up their lives and move on, she has been to court to help women fight back and become victims no longer. She has seen women go back to the men who are abusing them and she has seen women break out of the abusive relationship, regain their confidence, and learn to stand again on their own. In short, Mindy has seen and done it all with regards to making a difference against domestic violence. 1 in 4 women will experience domestic violence at some point in her lifetime. With this kind of number, odds are you know at least one person who has been or will be a victim. According to the FBI, a woman in the United States is battered every 12 seconds. Also according to FBI stats, domestic violence is the leading cause of injury to women ages 15-44. More than car accidents, rapes and muggings - COMBINED! A boy who grows up in a violent home is 1500 (no, that's not a typo) times more likely to be an abuser as an adult. 85% of all men in Texas prisons grew up in violent homes. I don't have stats for the other 49 states, but I have a hard time believing that this is only happening within the Texas prison system or even only happening in the United States. The Dallas Police Department answers over 20,000 calls a year for domestic disturbance, but there are only 100 safe beds in all of Dallas County on any given night. Genesis Women's Shelter is making a difference, but they are a non profit organization and they operate on our donations and contributions. They are 100% privately funded. They are not supported by the government or the United Way. While this means fundraising is even more crucial, it also means they can run their programs the way they need to, better meeting the needs of their clients, and allowing them the flexibility to respond in the best way for the situation. What is the money used for? Since Genesis opened it's doors in 1985, they have developed a multi-faceted approach to helping women, breaking the cycle of violence by counseling children, partnering with law enforcement, and educating the community. The first contact many have with Genesis is through the hotline. This is answered 24 hours a day, 365 days a year. They have an emergency shelter which is in an undisclosed location and will house a woman and her children for 6 weeks. During this time the women are given free counseling, the children have play therapy, and individual case management. There is a Job Readiness program to help women re enter the workforce. They also offer day care and after school programs for the children. After the 6 week period at the shelter, the women and their children can go into a transitional housing program which a 3 month program with free housing, free bills, a continuation of counseling and job readiness help to meet each family's needs. Beyond this program is an 18 month program called Annie's House. Again in an undisclosed location, Annie's House continues counseling programs, but also teaches clients to live on a budget, emphasizing saving 30% of income. Some women have graduated from Annie's House with over $40,000 saved. For those who will not leave their abusers (or who don't live with their abusers - domestic violence is also the term used for abuse perpetrated by a former boyfriend or husband), there are outreach programs providing counseling, play therapy, and case management. Beyond addressing Domestic Violence after it has happened, Genesis works with local, state, and federal law enforcement officers, district attorneys, advocates, and anyone else who works with victims. Making sure that a victim of Domestic Violence gets the respect, assistance and services who will help her is an important part of breaking the cycle. Finally, Genesis works with local middle schools, high schools, colleges, and community groups about the dangers of Dating Violence. Domestic Violence is a Learned Behavior and educating children is a crucial part of ending it. All of the programs and assistance that Genesis provides are free of charge and funded by donations, fundraising drives and a thrift store that Genesis runs. If you are interested in donating to Genesis, here is a link to their online donation page. They also have a cookbook, Creating Comfort, which won the National Tabasco Award last year. From the $30 cost of the cookbook which includes shipping and handling, $25 goes entirely to shelter programs. It is also available online and makes a great gift. If you or a friend are in an abusive relationship and want help, you can call 1-800-799-SAFE. This is the National Domestic Violence Hotline and they will help you find services in your area. I've gotten a little bit more done on my Sockapalooza Pal's sock and I've actually started the heel flap. I am still loving this yarn (Merino/Tencel sock yarn from The Woolen Rabbit), the softness, the shine, and the drape of the sock. We are supposed to mail our socks to our pal during the first week of August so I've really got to get going on these. 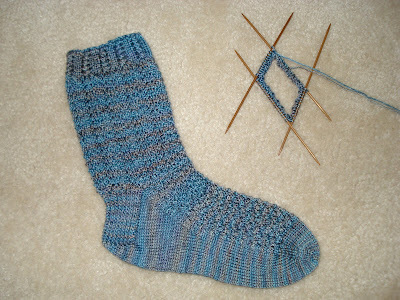 I probably need to finish up this first one over the weekend, so maybe next week you can see the first finished sock! In more exciting news (c'mon, you've seen half finished socks here before), I got my MOO Cards! These are so cute. They are only slightly larger than a stick of gum (Doublemint sized gum) and they are on a really nice cardstock. It almost has a laminated feel to it. I've needed something to tuck in with swap loot for a while and these will be wonderful. Caleb has already grabbed two of them (Finn's drumstick and Ramius sitting by the sweater - third row from the left, bottom and top) and is threatening to swipe more. I can't say he doesn't have good taste! Yesterday was a big day for MS3. A couple weeks ago I got an email from a columnist interested in writing a story about how the Mystery Stole Knit Along has taken off across the world. So he came out to the house yesterday to interview me. He brought along his copy editor (I hope I got the job title correct) who is actually part of the KAL - I got to see her stole! I felt like this would be an important thing to do for a couple of reasons: first, because knitting projects don't usually merit media attention and second that the group deserved to be recognized for what it represents - an international knitting circle that is working on the same project simultaneously and cooperatively despite language, cultural, religious, political, economic, and skill level differences. This group exists because the knitters keep coming back for more. Some of our numbers have been on board since MS 1, other's found us last year with MS2, but most of this year's knitalong is new to the Mystery Stole KAL. Because there was such a huge swell in numbers this year (more than 6 times last year's number and close to 9 times the first year's membership), we've gotten the media's attention. Oh, and just in case you were wondering what paper the columnist writes for? It's USA Today. WooHoo! I also need to take part of today's post and answer some questions that have been asked in previous blog comments because Blogger doesn't give me email addresses to reply to. If you missed the cut off for sign ups on the MS3 KAL, I'm sorry. The group is closed to new members at this point. You haven't missed out on the design entirely however, because I always release the design in a traditional pattern format after the KAL is over. I'm shooting for late August/early September for the pattern release. I also always put extras into the traditional pattern that aren't part of the KAL. If you want to make sure you don't miss out on the next MS KAL, take a look at my group Pink Lemon Knits - there's a link in the sidebar with more information. If you are being overwhelmed with mail and are thinking of leaving the group, you might consider going on Special Notice Only mails. This way you are still part of the group, you can read messages at the group's site, you can ask questions, but the only MS3 related mail you'll get will be Special Notices that I send out - mainly this will be announcements of the new clue being posted. To set this up, go into the group's site and at the top of the screen you'll see "Edit Membership." Click this and scroll down a bit. I think Mail Preferences are in #2. Change your settings to Special Notice Only and click "Save Changes" at the bottom of the screen. It can take Yahoo up to 48 hours to change your settings. If you want to unsubscribe to the group, go into the group's site and click "Edit Membership." Somewhere on that screen is "Leave Group." If you need to leave the group for whatever reason, you can unsubscribe that way. Again, it can take up to 48 hours for Yahoo to take you out of the email loop. Finally, for those of you who are wondering when MS4 will be, it will not be starting right after MS3 is over. Mystery Stole is a once a year thing. If I had to do it more than once a year, I wouldn't do it at all because of the huge amount of time it eats up. I'm spending 3-4 hours a day on the computer, just going through emails and answering questions. That doesn't include the designing and knitting time or the pattern writing time. We are making plans for MS4, but it won't be until next year. I love that you all love the idea of knitting a mystery, but I wouldn't enjoy it if it was more than once a year. If you want to make sure you are notified when MS4 has sign ups, please check out my Pink Lemon Knits group (link in the sidebar). Semi - Stealth Project, Now With Beads! I've been working along on my new Semi-Stealth Project. It's sitting just to the left of where your monitor is - what do you think so far? As you can see, I got the beads that I'm going to use in it. I can't remember the color number but they are size 8/0 seed beads from The Beadwrangler (if you're looking for beads, check her out - fast shipping, great prices and all that!) OK, so since I really shouldn't taunt you with pictures of yarn and beads and no knitting, I've coded one of the pixels in the picture above so if you click on it, it will open a window to the actual knitting! OK, that's not true at all. I made that up. I wouldn't even begin to know how to do such a thing. Seriously, quit clicking the picture now. Yesterday something big happened in the world of Mystery Stole 3. When I woke up, we had 4300+ members and everything was looking pretty normal around here. (By normal, I refer to the 150 or so emails in my inbox, you know - normal.) 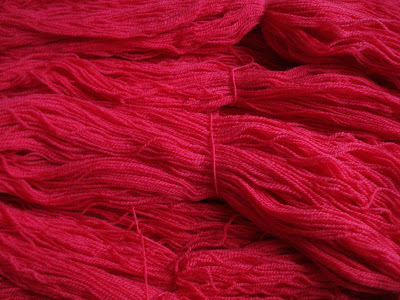 After deleting the spam and blogging about my new red yarn, I started wandering through my daily blog list. When I went to Chic Knits, what should I find? The wonderfully talented Bonne Marie is part of Mystery Stole 3! I have been reading Chic Knits for several years now, but I had no idea that for the last few months Bonne Marie had been lurking here at Pink Lemon Twist. This was certainly a wonderful surprise to start the day off with. After lunch, I sat down to begin knitting on the stealth red yarn project (just because you can see it from outer space doesn't mean it can't be a stealth project.) Then I got a phone call. From Christine. Four little words: "We have The Harlot!" After much squealing and jumping around on my part, she told me to go read Stephanie's blog entry. Not only do we have The Harlot, she's already started knitting! Of course, the combined powers of two such major knit bloggers have changed the situation a bit around MS3. As of 6:08 AM EDT, we had 5752 members and I had 339 emails. I'm now up to 360 so I've got to go! I hope all the Americans out there had a fabulous 4th of July! We started the day with the parade. Leesburg does several good parades throughout the year - we've been to the Halloween one before, but this was the first time at the 4th of July parade. It was lots of fun. Of course, there are always political candidates in the parades, shaking hands and passing out stickers to the kids - by the end of the parade Caleb looked like a billboard for democracy. Except for the part of the parade where the local Corvette club went by (I think Mickael teared up a bit), we all had a wonderful time. For those of you who aren't Americans, I hope you also had a nice 4th of July, but I'm guessing it didn't involve parades or fireworks. I knew I wanted almost a bright, clear true red, but I wanted it to pull just slightly towards the blue red side of the color wheel. I have pink undertones to my skin and orange reds are not a good mix for me. Landscapes Dyes have two reds: Grevilia is a cool red and Desert Pea is a warm red. I started with an even mix of the two, but then added just a bit more of the Grevilia to push the color very slightly towards the blue side. What you see above is what I got. I love it! I can't wait to start knitting with it. The only problem? I was talking on the phone to Christine* and didn't keep track at all of how much of which dye I used, so if I ever want to duplicate the color, I'll have to start from scratch. Ah, the joys of Seat of Your Pants Dyeing! *For those of you not in Mystery Stole 3, Christine is my co-moderator. She is in charge of all things computer tech related and has organized the translation efforts. I met her when I did the first Mystery Stole, 2 years ago and she bailed me out from some computer issues. I frequently refer to her as Kato to my Green Hornet, because let's be honest here, without Kato, the Green Hornet would have never gotten anything done. I'm still knitting on the Frostrosen Blob. It's creeping along so slowly right now that if it was the monster in a cheesy 50's horror movie, we'd be at the scene where the well dressed and perfectly coiffed but clearly brainless, female type would be running away from it with her hands held in the air in a dainty manner, screaming. Of course, she would be looking back at it and then trip and fall. At that point naturally, she would turn her head and scream even louder as the Shawl of Doom creeps across the floor, but she wouldn't bother standing up. In my opinion, it would totally serve her right to get eaten. I won't bore you with a picture of Frostrosen looking remarkably like it did the other day, hopefully the mental image of the Shawl of Doom will amuse you enough today.